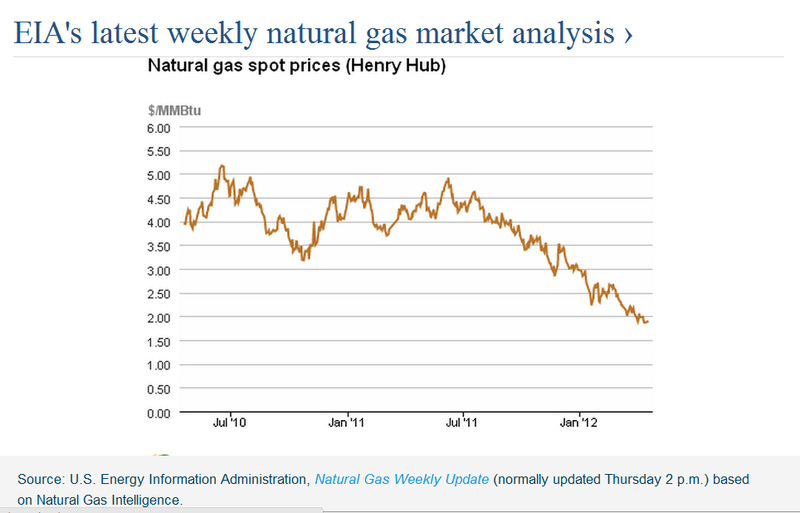 How will the low price and increased supply of Natural Gas change this distribution? From a high of $13 per million British Thermal Units (mmBTU) in 2008, natural gas prices have plummeted to below $2.50 per mmBTU, nearing record-setting lows. Natural gas prices are likely to stay in the $3-4 per mmBTU range over the next several years, as low-cost production from shale gas resources expands North American production. Ultimately, given the marginal production costs of domestic gas supplies, gas prices over the medium term are likely to settle within a $4-6 per mmBTU band, still well below levels prior to the North American shale gas boom. At these prices, electricity from gas-fired power plants has become the benchmark for new low-cost power generation, edging out even coal-fired power and providing added economic pressure for wind, solar, and nuclear power plants. CH4 - Methane - Primary component of natural gas. CO2 Intensity- The amount of CO2 produced by generating a given amount of electricity. How has the CO2 signature of our nation’s coal and gas-fired power fleet changed with time? From 1960-1990, there was no statistically significant change in gas fleet CO2 emissions, which held steady at 0.63-0.65 tons/MWh. 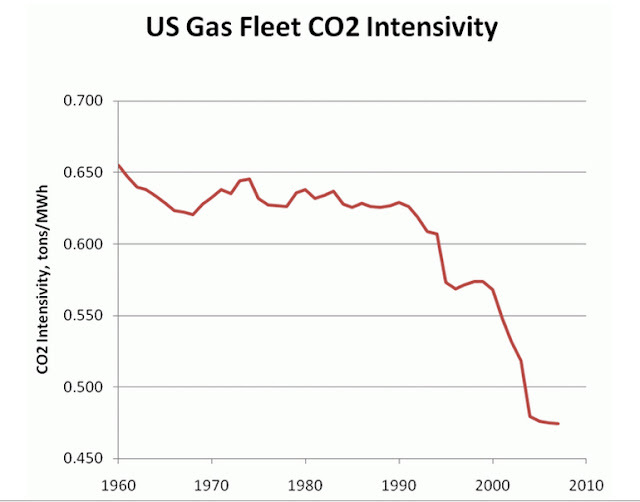 Then all of a sudden in the 1990s, the fleet transformed itself, reducing its CO2-intensivity by 25% in just 10 years. What happened? In a word: competition. The introduction of competitive access in the 1992 Energy Policy Act (and subsequent FERC rulings) brought forth a flood of natural gas plants, many of which were nearly twice as fuel efficient as the old junk that the grid had previously relied on. Prior to that point, costs were simply something that you passed along to customers. After that point — for much of the grid — cost control was a route to greater profits. Not surprisingly, generator owners suddenly got religion on cost-control. And when your number one cost is fuel, that means they got religion on fuel control. Does a newly dispatched gas plant look like one of the old, 30% efficient, natural gas-fired Rankine “steamers,” or does a newly dispatched gas plant look like one of the new, 50% efficient combined cycle gas turbines? Due to their ability to ramp up and down, Natural Gas is used for peaker plants, supporting the grid during periods of peak demand. Due to their infrequent use, some of these peaker plants have been optimized for lower capital cost rather than operating efficiency. From 1960-1970, the coal fleet holds steady at 1.17 tons/MWh, but then starts an inexorable upward trend. 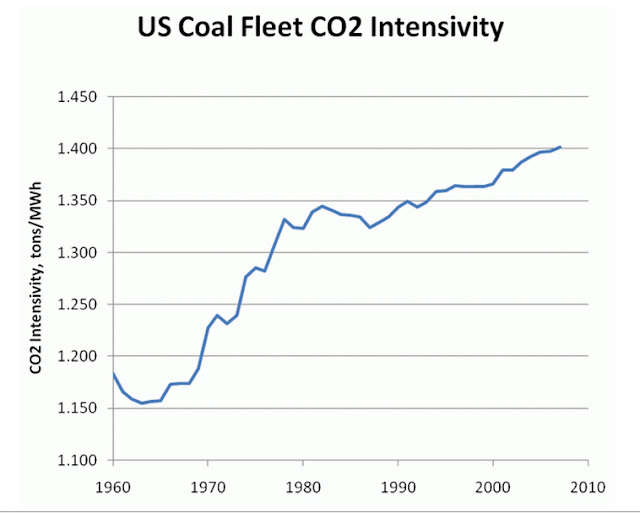 While the gas fleet became more efficient with time (after 1990, at least), the coal fleet is steadily less efficient. Way less in fact — to the point that the CO2 emissions associated with a MWh of coal-derived electricity are 18% higher today than they were in 1960. 1. Unintended consequences. 1970 saw the passage of the Clean Air Act, a deeply flawed bill. It was good in terms of what it did for regulated pollutants, but lousy in terms of what it did for unregulated ones (e.g., CO2). By effectively mandating pollution control approaches that impose parasitic loads on coal plants, the CAA is directly responsible for lowering coal plant energy efficiency, so that we now burn way more coal per MWh than we did before passage. 2. Dispatch considerations. As noted here, the last 30 years have seen virtually no construction of new baseload power plants in the US, but have seen a steady increase in the annual load factor of currently existing baseload plants. In other words, plants that used to spend most of their life turned off now spend most of their life turned on. In the coal fleet, that means that the least efficient stuff runs more now than it used to. So in addition to the unintended consequences of the Clean Air Act, we also have the simple fact of steadily growing electricity demand that causes us to pull our power from ever-more-undesireable sources. Why didn’t the competitive forces unleashed by the 1992 EPACT also drive up the efficiency of our coal fleet, like they did for gas? Again, it’s an easy answer: competition. Coal plants are lousy investments. No one builds them who has to put their own money at risk. 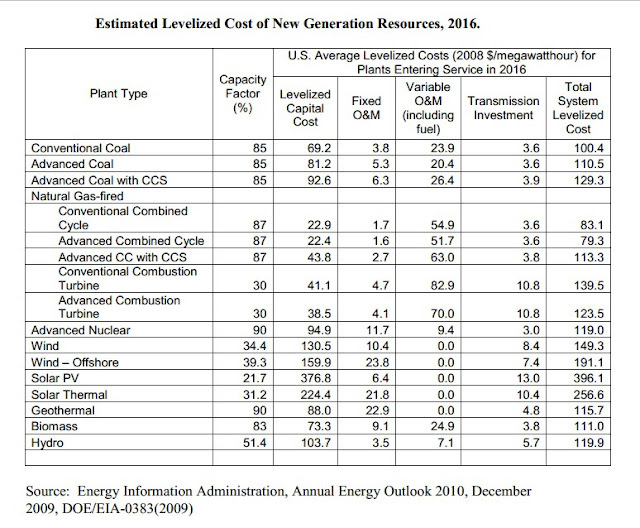 Coal Competitiveness - Over the next decade, 52 gigawatts' worth of existing coal plants could be retired, representing a sizeable 16 percent of the U.S. coal fleet, because the cost of retrofitting them to meet new emissions requirements will outweigh the benefits. Financial institutions, meanwhile, continue to remain skeptical about funding new coal plants. GWP - Global Warming Potential - Commonly used to compare the radiative forcing of ifferent gases relative to CO2 and represents the ratio of the cumulative radiative forcing t years after emission of a GHG to the cumulative radiative forcing from emission of an equivalent quantity of CO2 . Comparing the climate implications of CH4 and CO2 emissions is complicated because of the much shorter atmospheric lifetime of CH4relative to CO2. On a molar basis, CH4 produces 37 times more radiative forcing than CO2. However, because CH4is oxidized to CO2 with an effective lifetime of 12 yr, the integrated, or cumulative, radiative forcings from equi-molar releases of CO2 and CH4 eventually converge toward the same value. Determining whether a unit emission of CH4 is worse for the climate than a unit of CO2 depends on the time frame considered. Because accelerated rates of warming mean ecosystems and humans have less time to adapt, increased CH4emissions due to substitution of natural gas for coal and oil may produce undesirable climate outcomes in the near-term. The Intergovernmental Panel on Climate Change (IPCC) typically uses 100 yr for the calculation of GWP. Howarth et al. emphasized the 20-year GWP, which accentuates the large forcing in early years from CH4 emissions, whereas Venkatesh et al. adopted a 100-yr GWP and Burnham et al. utilized both 20-and 100-yr GWPs. A second limitation of GWP based comparisons is that they only consider the radiative forcing of single emission pulses, which do not capture the climatic consequences of real-world investment and policy decisions that are better simulated as emission streams. Compared to Fossil Fuels, Renewable Energy has high capital cost and low operating costs. Several economic assumptions are needed in order to compare the total cost. Discount Rate - Historically, LCOE calculations for solar have been conservative and on the high side. the discount rate used for solar investments has been relatively high. This is especially problematic in energy economics. “The energy escalation rate can be higher than the discount rate because the cost of energy over time is generally going up. System Life - A panel has no moving parts; it’s all electronic and a solid-state device,meaning that should last “a long, long time.This means “we should be doing our economic analysis at least on a 30-year lifetime,” but there is not yet adequate data. Nuclear Competitiveness - Persistent challenges in the financing of nuclear generation facilities, caused by high upfront capital requirements and a stringent regulatory environment, are mitigated somewhat by federal loan guarantees and incentives for new production. The Section 1703 DOE Loan Guarantee Program is authorized to guarantee up to $22.8 billion in total loans to the nuclear sector, including both new power plants and “front-end” fuel cycle projects, of which the DOE has committed $10.3 billion to date. New nuclear power projects also benefit from a production tax credit of $18/MWh available to the first 6,000 MW of new installed generation as well as federal cost overrun insurance in the event of regulatory delays to construction. With over 30 proposed reactors being reviewed by the Nuclear Regulatory Commission as of March 2011, there is no shortage of potential new nuclear generation. At the same time, however, new nuclear projects must also compete with the surging availability of lowcost natural gas. The US Energy Information Administration (EIA) estimates the levelized cost of electricity from new nuclear plants at around $114 per MWh for reactors entering construction now and becoming operational in the 2016-2020 time period. Given the overall uncertainty about construction costs for new reactors, this estimate should be considered tentative, but EIA does rely on total overnight capital cost estimates consistent with the expected cost of two Westinghouse AP1000 reactors currently under construction by Georgia Power. Solar -Commercial and Residential Competitiveness- After significant recent cost reductions, the unsubsidized cost of electricity from solar installations on residential rooftops dropped to a range of $178 to $345 per MWh in late 2011, although higher prices are possible for projects with poor capacity factors. These prices are now at or near cost parity with retail electricity rates in certain US markets with the right combination of high electricity prices and/or high solar irradiance. Rooftop solar projects are typically cost competitive now without subsidy in Hawaii, where retail electricity rates average $281/MWh. Depending on the pace of innovation and cost reductions, rooftop solar is also within striking distance of unsubsidized retail grid parity in several sunny states with relatively high electricity rates, including California, Texas, Florida, and Nevada, as well as a set of northeastern states (Connecticut, New York, New Jersey, and New Hampshire), where residential electricity rates exceed $160 per MWh and solar irradiance is modestly high. With the benefit of the ITC and additional state incentives, markets for rooftop solar are currently robust in each of these states. Solar Utility Scale Competitiveness - Like wind power, utility-scale solar power projects are pressured by competition from low-cost natural gas. Large, central-station solar PV and solar thermal power projects typically compete most closely with peaking power plants, often gas combustion turbines, with estimated costs in the $71.5-103.5 per MWh range at likely gas prices. In contrast, the unsubsidized levelized cost of electricity from typical utility scale solar PV installations fell between $111 and $181 per MWh in late 2011, a broad range that captures wide discrepancies in regional solar resources.54 With the support of federal and state subsidies, solar projects in California, the largest solar market in the United States, have achieved contract bids below $90 per MWh, a historic low-point in the trend towards cost parity in solar markets. Despite significant declines in solar costs in recent years, however, solar PV projects still have difficulty competing in wholesale power markets with new gas-fired generation with out subsidy or policy support, except perhaps in regions with the highest solar resource. Going forward, analysts expect continued declines in solar PV module and system prices. With the right innovation and market supply/demand conditions, unsubsidized utility scale solar PV costs may decline into the $90-150 per MWh range by 2014 and the $40-66 per MWh range by 2020. These forecasts show solar achieving wide cost parity with natural gas generation within the decade, but will require sustained innovation by industry and optimized public policy support. In the meantime, solar currently benefits from a 30 percent investment tax credit (ITC) not scheduled to expire until 2016, which will help solar PV remain competitive in a much wider range of markets. After 2016, the ITC reverts to a permanent 10 percent business tax credit, while a personal income tax credit for residential installations expires. Several states also offer additional tax credits and incentives for solar power producers. For the time being, US solar markets thus face somewhat greater policy certainty than wind power markets. If we shifted our power generation fleet to preferentially dispatchnatural gas plants instead of coal plants, how much would CO2 emissions fall? 50% of U.S. power generation (in MWh) comes from coal, while only 20% comes from natural gas. 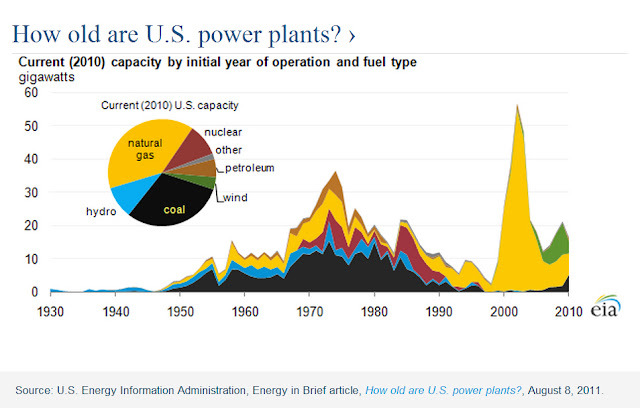 32% of total U.S. power generation capacity (in MW) is coal-fired, while 42% is gas-fired. When it runs, the natural gas fleet emits just 50% of the CO2 of the coal fleet, which raises a rather interesting question: what would we have to do to make it run harder? And how big a difference would that make in our national CO2 footprint? 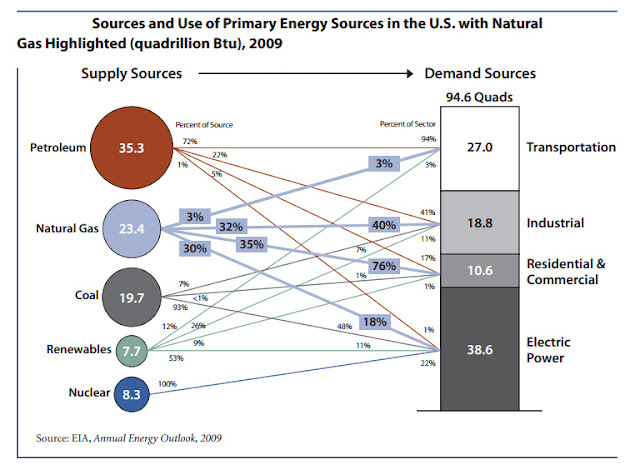 So why, if we have more natural gas generation capacity, do we get more of our power from coal? Simple: we have a lot of gas-fired generation (449 GW, as of 2007), it doesn’t run very often. The coal fleet is comparatively smaller (336 GW), but runs a lot more frequently. It is as if our vehicle fleet were dominated by Priuses, but they stayed parked while we drove our Escalades to work. We have a huge resource that is already built that could massively lower CO2 emissions. What if the problem isn’t that we need to build more low-carbon generation, but that we just need to make better use of what we have? To understand the opportunity, let’s look at a bit of simple math. In 2006, the gas fleet generated 816,441,000 MWh, or 20% of what it could have produced if it had run 24/7/365. The coal fleet, by contrast, generated 1,990,551,000 MWh, or 68% of what it could have generated if it had run 24/7/365. If we never built another gas-fired power plant, but simply increased the annual capacity factor of the gas fleet up to the coal fleet’s 68% capacity factor, it would generate an additional 1,845,485,000 MWh, effectively displacing 93% of our coal fleet without the construction of a single new power plant. Looking at the comparative CO2 -signatures of those two fleets, that would reduce total power sector CO2 emissions by 37%. Since the power sector is responsible for 42% of U.S. CO2 emissions, that implies a 16% reduction in total U.S. CO2 emissions, just from changing generator dispatch order. That’s a massive opportunity. What would it take to get there? The figure below illustrates the range of likely levelized costs of electricity from both advanced combined cycle gas plants (typically used for baseload and intermediate generation and competing with wind, nuclear, and baseload coalfired power plants) and plants using conventional combustion turbines (typically used for peak or load-following power and competing with central-station solar and peaking coal-fired power plants). beneﬁt being reduced oil dependence. Compressed natural gas (CNG) will play a role, particularly for high-mileage ﬂeets, but the advantages of liquid fuel in transportation suggest that the chemical conversion of gas into some form of liquid fuel may be the best pathway to signiﬁcant market penetration. The current annual consumption of natural gas in the US is around 22 tcf, and the added shale gas is a very welcome relief as is portends a supply of about 38 years—but that is at the current rate of consumption. If the consumption continues to increases at its historical average of 2.0%/yr this amount would be exhausted in 29 years, and even sooner at a higher growth rate as is expected from the opening of newer markets. The best part of it is that it buys us time to develop alternatives that can make a lasting impact. Balance of Trade - The US will have an international competitive advantage because China does not have a source of domestic natural gas. The US has seen a marked decrease in fossil fuel imports due to the recession and an increasingly efficient economy, as well as the recent increase in production of oil and natural gas discussed above. 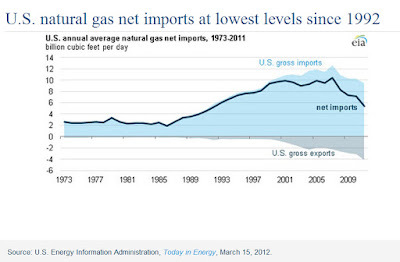 Our net energy imports are lower, on a net basis, than they have been for about ten years. We now import about 46% of our petroleum needs, down from about 60% a decade ago. EIA projects that this figure will fall to 36% by 2035. This seems very optimistic to me given our knowledge about decline rates from existing oil fields, but, as always, time will tell. Reduced Carbon Emissions from Coal - The shale gas provides the US with an energy resource that is much cleaner than coal and has about one-half its carbon footprint. Natural gas-fired power plants operating in combined cycle mode (NGCC) emit less than 400 g CO2/Kwh, whereas a typical coal-fired plant emits 850 g for the same kWh. 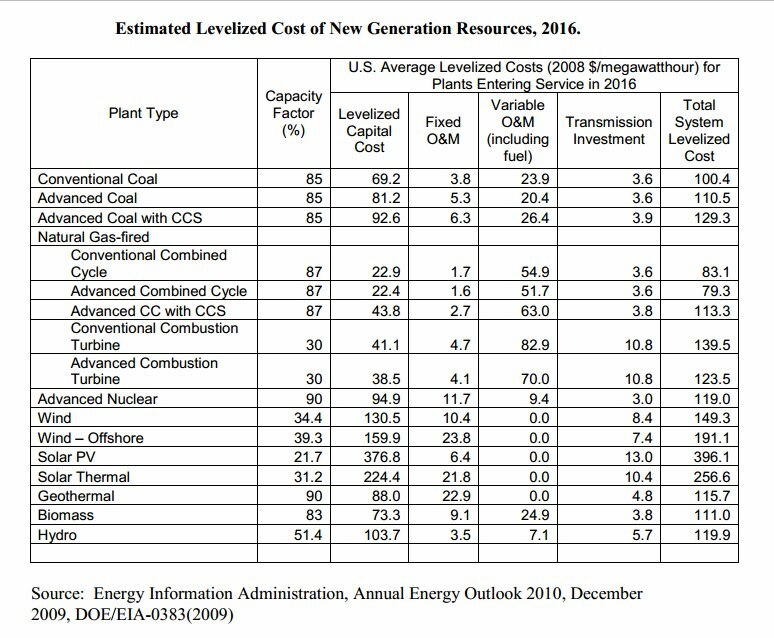 Natural gas power plants also have low capital expense: about $700/Kw capacity compared to $1400-$2000 per kW for a coal-fired plant. In the past, the gas price was high, and so the natural gas was generally used for providing power during periods of peak demand, while the coal-fired or nuclear plants were used for base power. However, if the gas price is low (<$2.00/MMBtu), there is no reason why NGCC plants could not be used to provide base power. More than the rise of renewables, cheap natural gas has paved the way for the retirement of more than 100 coal-fired powered plants, too aged to meet federal clean air rules. Manufacturing Jobs - About a third of the natural gas is used for producing hydrogen, which in turn is used industrially to refine fuels or produce fertilizers. The large availability of natural gas at relatively low cost has allowed US refineries to increase their output. Monthly exports of finished petroleum products hovered around 25 millions barrels for 20 years between 1985 and 2005. Since 2005, the monthly exports of finished products from the US have grown to about 80 million, which has also helped with the balance of payments. Less than a decade ago, natural-gas-reliant manufacturers were decamping from the U.S., transplanting operations to the Arabian Gulf, Latin America and other gas-rich regions. Now many are returning. Makers of chemicals, fertilizer and pharmaceuticals, all of which use natural gas as both an energy source and a raw material are returning stateside, lured by natural gas for under $2.50 per thousand cubic feet, less than fifth of the price in Europe or East Asia. Given EPA’s current estimates of CH4 leakage from natural gas production and delivery infrastructure, in addition to a modest CH4 contribution from the vehicle itself (for which few empirical data are available), CNG-fueled vehicles are not a viable mitigation strategy for climate change. climate benefits are achieved; the comparable cross-over point for heavy-duty diesel vehicles is nearly 300 yr.
equivalent to a fuel economy improvement of 3 mpg in a 30 mpg fleet. CNG vehicles fare even less favorably in comparison to heavy-duty diesel vehicles. In contrast to the transportation cases, a fleet of new, combined-cycle natural gas power plants reduces radiative forcing on all time frames, relative to new coal plants burning low-CH4 coal—assuming current estimates of leakage rates (Fig. 1C). The conclusions differ primarily because of coal’s higher carbon content relative to petroleum fuels; however, fuel-cycle CH4 leakage can also affect results. To provide guidance to industry and policymakers, the paper also determined the maximum well-to-wheels or well-to-burner-tip leakage rate needed to ensure net climate benefits on all time frames after fuel-switching to natural gas (see Fig. 2). For example, if the well-to-wheels leakage was reduced to an effective leak rate of 1.6% of natural gas produced (approximately 45% below the estimate of current leakage of 3.0%), CNG cars would result in climate benefits immediately and improve over time. For CNG to immediately reduce climate impacts from heavy-duty vehicles, well-to-wheels leakage must be reduced below 1%. Fig. 2C shows that new natural gas power plants produce net climate benefits relative to efficient, new coal plants using lowgassy coal on all time frames as long as leakage in the natural gas system is less than 3.2% from well through delivery at a power plant. Fig. 2 also shows, for a range of leakage rates, the number of years needed to reach the “cross-over point” when net climate benefits begin to occur after a fuel-technology choice is made. LNG - Liquid Natural Gas- Although we still produce most of our natural gas,we import substantial amounts. We want to be very cautious about any increased use of natural gas that invoves more Liquified Natural Gas (LNG) imported in tankers. LNG tends to have a much higher combined leakage/spill rate than natural gas moved in pipelines. World Market Uncertainty - A few years ago the US was slated on becoming a major gas importer, in anticipation of which facilities from handling liquefied natural gas (LNG) were being built. Now it appears that US could make use of those facilities for exporting LNG. Since shutting down most of their nuclear plants, Japan and Germany have increased import of natural gas. 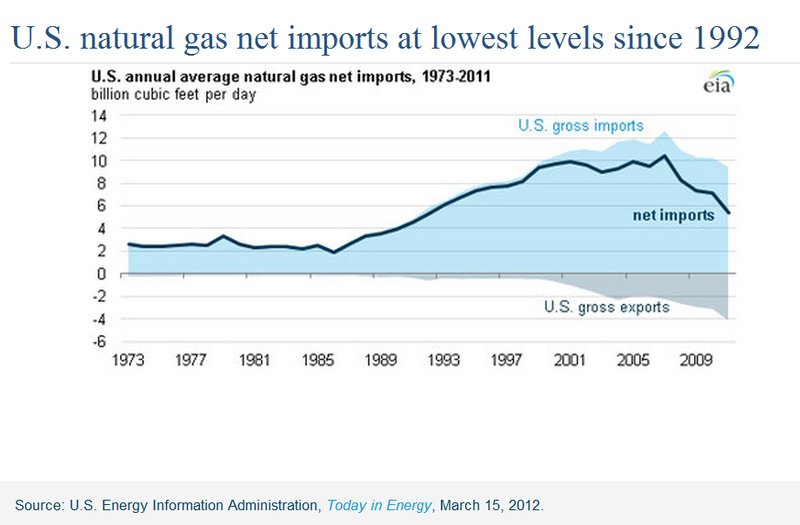 LNG export represents a likely expansion market for US natural gas. Unlike the oil market, current natural gas markets are not integrated globally. In today's markets, natural gas prices span a range from $0.75 per million British thermal units (MMBtu) in Saudi Arabia to $4 per MMBtu [now $2] in the United States and $16 per MMBtu in Asian markets that rely on LNG imports. Prices in European markets, which reflect a mix of spot prices and contract prices with some indexation to oil, fall between U.S and Asian prices. 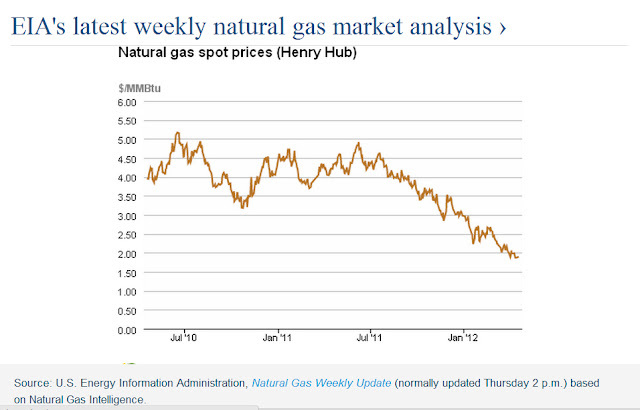 Spot market prices at the U.K. National Balancing Point averaged $9.21 per MMBtu during November 2011. Liquefaction projects typically take four or more years to permit and build and are planned to run for at least 20 years. As a result, expectations of future competitive conditions over the lifetime of a project play a critical role in investment decisions. The current large disparity in natural gas prices across major world regions, a major driver of U.S. producers’ interest in possible liquefaction projects to increase natural gas exports, is likely to narrow as natural gas markets become more globally integrated. Key questions remain regarding how quickly convergence might occur and to what extent it will involve all or only some global regions. In particular, it is unclear how far converged prices may reflect purely “gas on gas” competition, a continuing relationship between natural gas and oil prices as in Asia (and to a lesser extent in Europe), or some intermediate outcome. As an example of the dynamic quality of global gas markets, recent regulatory changes combined with abundant supplies and muted demands appear to have put pressure on Europe’s oil-linked contract gas prices. U.S. market conditions are also quite variable, as monthly average Henry Hub spot prices have ranged from over $12 to under $2 per MMBtu over the past five years. Furthermore, while projected Henry Hub prices in the AEO2011 Reference case reach $7.07 per MMBtu in 2035, in the High and Low Shale EUR cases prices in 2035 range from $5.35 per MMBtu to $9.26 per MMBtu. Given available prices in export markets, lower or higher U.S. natural gas prices would tend to make any given volume of additional exports more or less likely. The prospects for U.S. LNG exports depend greatly on the cost-competitiveness of liquefaction projects in the United States relative to those at other locations. The investment to add liquefaction capacity to an existing regasification terminal in the United States is significant, typically several times the original cost of a regasification-only terminal. However, the ability to make use of existing infrastructure, including natural gas processing plants, pipelines, and storage and loading facilities means that U.S. regasification terminals can reduce costs relative to those that would be incurred by a “greenfield” LNG facility. Many of the currently proposed LNG supply projects elsewhere in the world are integrated standalone projects that would produce, liquefy, and export stranded natural gas. These projects would require much more new infrastructure, entailing not only the construction of the liquefaction plant from the ground up, but also storage, loading, and production facilities, as well pipelines and natural gas processing facilities. While the additional infrastructure for integrated standalone projects adds considerably to their cost, such projects can be sited at locations where they can make use of inexpensive or stranded natural gas resources that would have minimal value independent of the project. Also, while these projects may require processing facilities to remove impurities and liquids from the gas, the value of the separated liquids can improve the overall project economics. On the other hand, liquefaction projects proposed for the lower-48 United States plan to use pipeline gas drawn from the largest and most liquid natural gas market in the world. Natural gas in the U.S. pipeline system has a much greater inherent value than stranded natural gas, and most of the valuable natural gas liquids have already been removed. Future exports of U.S. LNG depend on other factors as well. Potential buyers may place additional value on the greater diversity of supply that North American liquefaction projects provide. Also, the degree of regulatory and other risks are much lower for projects proposed in countries like the United States, Canada, and Australia than for those proposed in countries like Iran, Venezuela, and Nigeria. However, due to relatively high shipping costs, LNG from the United States may have an added cost disadvantage in competing against countries closer to key markets, such as in Asia. Finally, LNG projects in the United States would frequently compete not just against other LNG projects, but against other natural gas supply projects aimed at similar markets, such as pipeline projects from traditional natural gas sources or projects to develop shale gas in Asia or Europe. Price Volatility- The increased demand on natural gas supplies for electrical power production, exports or transportation would lead to an inevitable increase in the price of natural gas for home heating and industrial production. Good for gas producers, bad for everyone else. Peak Oil - Due to new fracking technology, high oil prices and the end of the recession, US oil production increased from 4.9 million barrels a day in 2008 to 5.6 million in 2011. This increase is largely due to a dramatic increase in the number of drilling rigs, which is simply pulling more oil out of the ground, earlier, and not adding to long-term supplies. The fact remains that the increase brought us back only to 2003 levels and US oil production is a bit more than half of what it was at its peak in 1970. It is not even close to an all-time high. This is not a small discrepancy in facts. It's about as important a fact as any fact a pundit should know when it comes to discussions about our current and future energy needs. We produce less than six million barrels of oil per day and we consume about nineteen, a difference of about thirteen million barrels per day. Even when we add in liquid fuels from domestic natural gas production and biofuels, we still import about 40 percent of our petroleum. But even with increased production from tight oil fracking, EIA projects that the US will be pumping 6.1 million barrels per day by 2035, about the same as we're pumping today. Clearly, fracking is not going to make us energy independent, though it may significantly extend the declining tail of domestic production. The International Energy Agency (IEA) is theinternational equivalent of the EIA. In 2008 IEA completed a supply-side analysis of the world's 800 biggest oil fields. IEA looked at the 800 largest oil fields and calculated their rate of decline. They found that these fields were declining far faster than previously assumed, about 7 percent per year rather than the previous estimate of 3.5 percent per year. This may not sound like a large difference but when we project into the future we see that many millions of barrels of new oil production are required to offset the declines in existing fields. In fact, IEA projected that 64 million barrels per day would have to come online by 2030 in order to make up for the decline in production from existing fields and to meet increased demand. This is equivalent to the entire production from nine and a half Saudi Arabias. The enormity of this task should be readily apparent. Coal Export - Proposals are on the table to capitalize on Asia's thirst for cheap energy by building a half-dozen terminals in Washington and Oregon that would export coal from the Rockies. If each of the proposed terminals, which range from Bellingham to Coos Bay, is built to capacity, Washington and Oregon eventually would export 150 million or more tons of coal a year -- half again as much coal as all U.S. exports combined in 2011. While the National Environmental Policy Act (NEPA) requires federal agencies to review the environmental impact of major decisions, it's not clear if carbon-dioxide emissions from burning U.S. coal overseas qualifies. Still, some regional leaders are insisting the impacts on climate play a role in assessing the future of the projects. They argue, as have environmentalists, that if the U.S. supplies Asia with cheap coal, places such as China and India will invest in new coal-fired power plants and the incentive to find cleaner energy will plummet. Reductions in CH4 Leakage Are Needed to Maximize the Climate Benefits of Natural Gas - While CH4 leakage from natural gas infrastructure and use remains uncertain, it appears that current leakage rates are higher than previously thought. Because CH4 initially has a much higher effect on radiative forcing than CO2, maintaining low rates of CH4 leakage is critical to maximizing the climate benefits of natural gas fuel-technology pathways. Many carbon reduction "wedges" will be necessary to mitigate climate change. A wedge represents an activity that reduces emissions to the atmosphere that starts at zero today and increases to 1 giga tonne per year of reduced carbon emissions in 50 years, a cumulative total of 25 giga tonnes of emission reduction over 50 years. To solve the carbon and climate problem over the next half century, would mean deploying the technologies and lifestyle changes necessary to fill seven to nine wedges. Combined these would reduce carbon emissions enough to stablise carbon concentration in the earth’s atmosphere. New Study: Solar Grid Parity Is Here Today A definitive new LCOE study says solar has achieved parity. Herman K. Trabish, Dec 7, 2011, Greentech Media. That's why more nuclear power plants must be built. Our electricity sources are running out, things are disappearing at an extreme pace. I believe we should do something now in order to save the resources that remain.